Ultimaker PVA (polyvinyl alcohol) is a 3D printing material commonly used to create water-soluble support structures to achieve complex geometries. 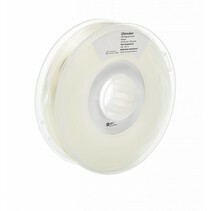 Ultimaker PVA is specifically used on the Ultimaker S5, Ultimaker 3 and Ultimaker 3 Extended. The instructions on this page are intended for these printers and materials only. Successful printing with Ultimaker PVA requires an ambient temperature below 28 °C and a relative humidity below 55%. Always use the latest version of Ultimaker Cura and make sure that your Ultimaker has the latest firmware update to include the correct material profile for Ultimaker PVA. Note: The information provided here applies to Ultimaker PVA only. Similar quality cannot be guaranteed with third-party filaments. We have extensively tested preconfigured Ultimaker Cura profiles for the optimal results when printing PVA support structures in combination with a build material on the Ultimaker S5, Ultimaker 3 and Ultimaker 3 Extended. Below is an overview of the compatibility of PVA with other Ultimaker build materials. The use of Ultimaker PVA in combination with PC and PP is not supported, due to insufficient adhesion between PVA and these materials, which will most likely result in print failure. Ultimaker PVA requires a build plate temperature of 60 °C when printed as a single material. If PVA is printed as a support material, simply use the build plate temperature required for the accompanying build material (see the table below). A nozzle temperature between 215 - 225 °C is used for the Ultimaker PVA print profiles in Ultimaker Cura for the Ultimaker S5, Ultimaker 3 and Ultimaker 3 Extended, depending on the selected print core size and profile. For the best results, connect to the Ultimaker 3 printer in Ultimaker Cura over a network. When printing via a network the print cores will be automatically detected by the Ultimaker S5, Ultimaker 3 and Ultimaker 3 Extended. The NFC chip on the new Ultimaker material spools will automatically load the correct material and printing settings in Ultimaker Cura. For best results, use a fan speed of 50% for print cooling while PVA is being printed. For the 0.8 print core, the fan speed will gradually increase to 100% on shorter layers. Ultimaker PVA adheres well to the heated glass plate. The adhesion method may, however, differ based on the accompanying build material. We suggest applying a thin layer of glue (included in the accessory box of your Ultimaker) to the glass plate for PVA. For dual-extrusion prints, the adhesion method should be based on the accompanying build material. Use a thin layer of glue when printing PVA in combination with PLA, Tough PLA, Nylon, and CPE. When printing PVA as a single material, the recommended adhesion method is a brim. A brim is made of extra lines printed around the perimeter of the first few layers of your model to ensure successful adhesion to the build plate. This is the default adhesion method when dual-printing with the Ultimaker S5 and Ultimaker 3 family of 3D printers. When printing in combination with another material we recommend using the adhesion method for the accompanying material. For currently compatible build materials this means using a brim. For the best adhesion and print quality, we recommend printing the build plate adhesion type with PVA (Extruder 2). Additional accessories are not required to create a stable printing environment for PVA. However, based on the accompanying build material it may be necessary to use the front enclosure included the Advanced 3D Printing Kit, e.g. if printing in combination with Ultimaker PC. Furthermore, it is very important to handle PVA correctly when in use. Once opened, PVA will absorb moisture from the ambient environment. To minimize this, print in a room with a relative humidity below 50% and always store the spool in a re-sealable bag with the supplied desiccant immediately after printing. When the material is not in use, we recommend storing it under the conditions described in our material storage guide. Ultimaker PVA is safe to print when using the recommended temperatures listed in the table above. To ensure a comfortable and healthy environment, we recommend 3D printing in a well-ventilated area. For more information, download the safety data sheet for Ultimaker PVA here.